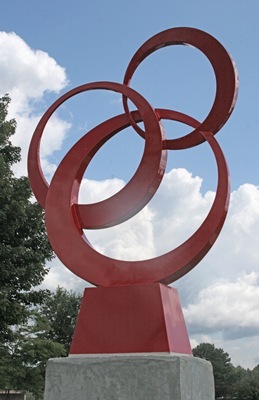 What began as a gift of sculpture to an open area on the North Central Michigan College (NCMC) campus is now a spectacular sculpture garden filled with 26 pieces of vibrant art. 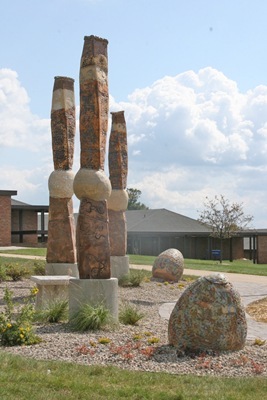 The late retired business man and NCMC benefactor Jack Harris first approached the college about donating a piece of sculpture several years ago. Then came another sculpture gift by Jack. Followed by another. And another. As each sculpture was placed, the gardens grew. The Harris Gardens are now not only a sculpture garden but also a beautifully landscaped garden area with benches and pathways. Each of the 16 sculptures are identified with a plaque. Maps identifying each of the works are available. The variety of artistic styles in each of the sculptures is dramatic. The artists who created these pieces of art come from across the U.S. The sculptures are made from a variety of materials include steel, bronze, copper, and stone. Some are whimsical, some reflect history, others reflect thought. The wide, spacious lawn areas where the gardens have "grown", are surrounded by NCMC buildings and pathways flow through the sculptures. Harris recently passed away and the sculpture garden is a wonderful legacy to his love of art and learning. The students at NCMC can often be seen contemplating a sculpture or sitting on a bench next to a sculpture. The Harris Gardens enrich the daily life of the students. Open to the public year 'round (free of charge), the Harris Gardens are located on the NCMC campus on Howard Street in Petoskey. Petoskey - Something for Everyone!